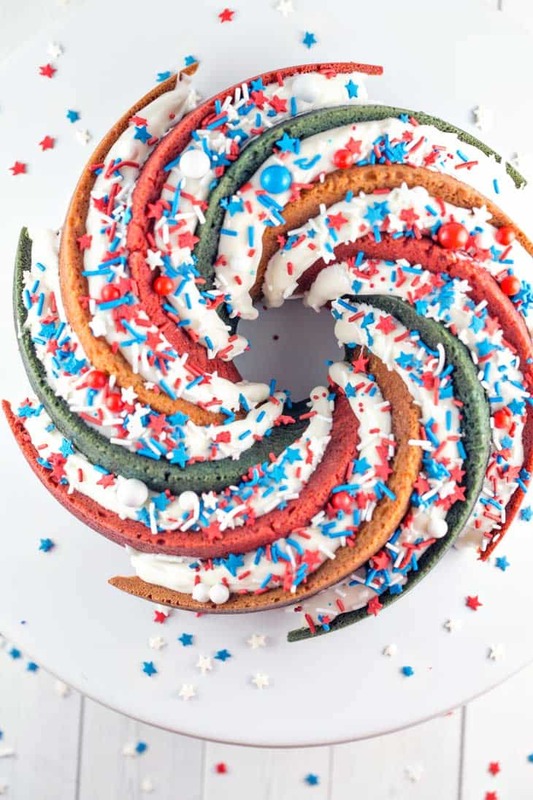 Celebrate America with the ultimate patriotic cake: this three-toned Red White and Blue Bundt Cake is as delicious as it is beautiful. 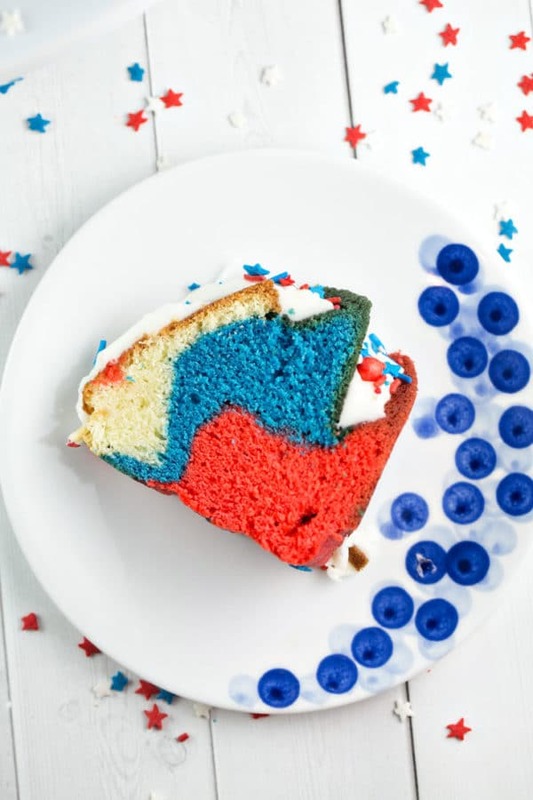 So long, flag cake — there’s a new 4th of July dessert in town! Before we dive into this spectacular cake (I think it’s my favorite cake I’ve ever made, and I’ve made a lot of cakes), can I share with you the ridiculous amount of anguish that went into when to post this? If you’re a regular reader, you know I’m doing a yearlong series on bundt cakes. I share a new bundt cake every month. So this is probably June’s bundt cake of the month.. right? Wrong. Because later this week is my 6 year blog-iversary, and I have a celebratory bundt cake to share for the occasion. (That’s right – this is a two bundt cake week. Get excited.) . My initial plan was to share this July 1st for July’s bundt cake of the month. 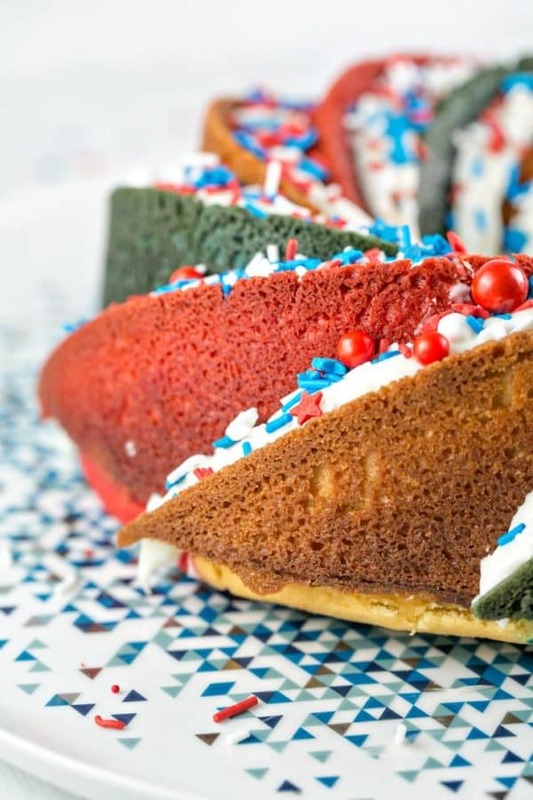 Buuuut… then July 4th is just a few days away and you might not have time to make this. 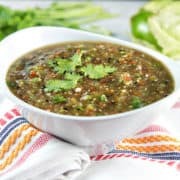 And you should definitely make this. But I’m also a rule-follower and if it’s not July, I can’t count this as July’s bundt cake. So guys, this is just an extra bonus bundt cake. And what an extra bonus it is! 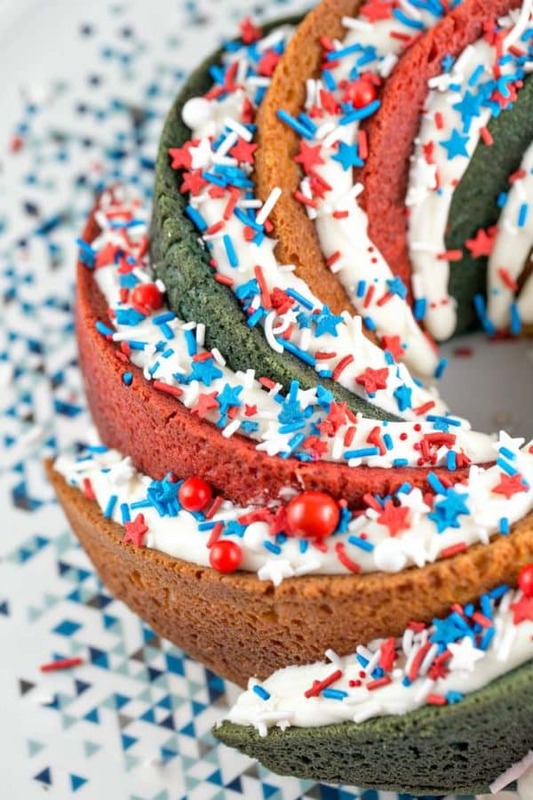 This patriotic Red White and Blue Bundt Cake will be the talk of your 4th of July party. (Or Labor Day BBQ, because this cake is way too good to just make once a year). 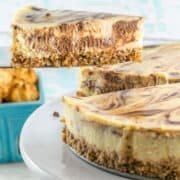 A few years ago, BuzzFeed featured my chocolate oreo peanut butter torte as an answer in their “What Dessert Should You Bake This Weekend?” quiz. Of course, I had to take the quiz, and my answer was this amazing Rocky Road Bundt Cake. 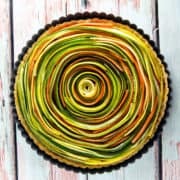 The two-tone spirals blew me away, and I knew I had to recreate it in my own kitchen. Since the spiral bundt pan (Amazon links are affiliate) has 9 swirls, I wanted to make a three toned cake, rather than two toned. 4th of July is my favorite holiday, so the red, white, and blue theme seemed obvious… but would it work? The top of bundt cakes get pretty dark as they bake, so would the color change be noticeable? In a word – YES! No, the colors aren’t as bright and vibrant on the outside as they are inside, but you can absolutely tell the difference. 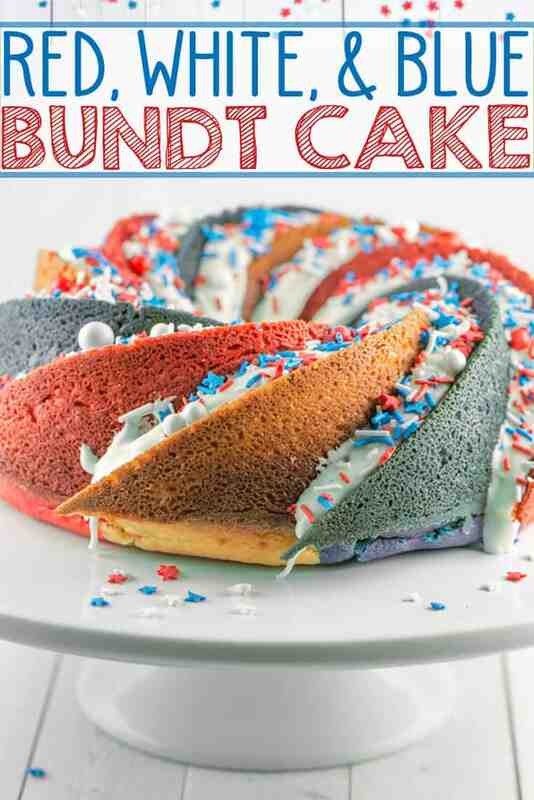 Patriotic Red White and Blue Bundt Cake SUCCESS! Making this is a lot easier than it seems, and while I used the spiral bundt cake pan, you can use any bundt pan with some sort of structural design. Start by making one large batch of the cake batter. Divide into three bowls (I just eyeballed thirds) and color one bowl with red one blue. I always use Americolor Gel Food Coloring for the brightest colors without watering down the batter. 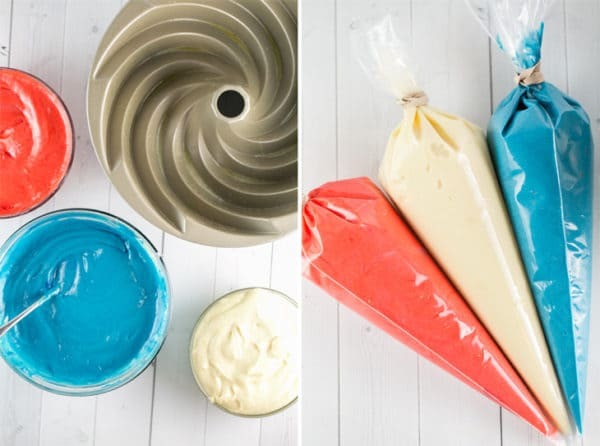 Scoop each color into a separate piping bag (or large ziploc bag). Snip off just the very end of the bag and start by filling each line with your color of choice. Go back and add a little more, one color at time. Keep filling up the pan, sticking with the spiral pattern, until you use up all the batter. Don’t worry if it’s not perfect – a little of each color will bleed into the next spiral. It’s fine; you won’t see it anyway once you add the white glaze. 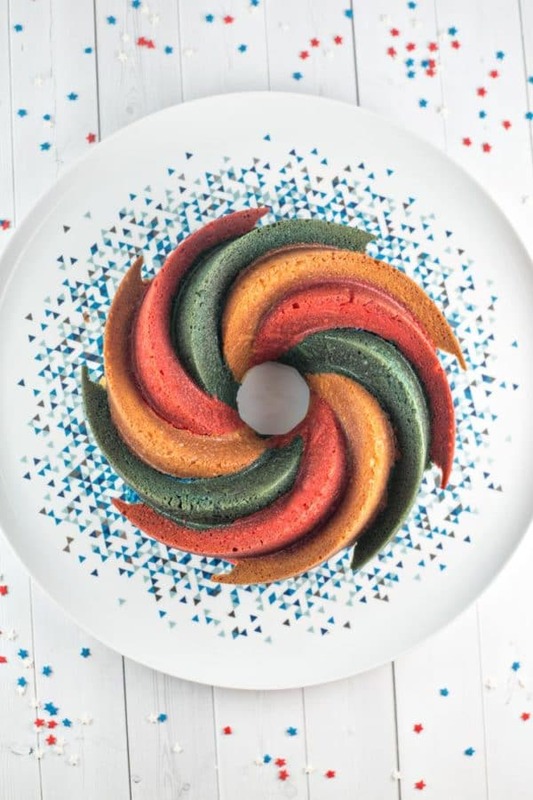 Now that we’ve gotten the impressive part out of the way (the tri-colored spirals), let’s talk about this CAKE! It is, by far, my favorite of the bundt cakes I’ve made thus far in my Bundt Cake of the Month journey. Rich, buttery, and not at all dry – just what I was looking for in a plain vanilla cake. You all know I hate (haaaaaate) cream cheese frosting, so I kept this simple with a basic glaze. To make it extra white and a thick enough consistency to pipe (and extra delicious!) I just used heavy cream instead of water. 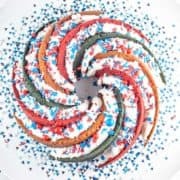 Cover with a generous layer of your favorite festive red, white, and blue sprinkles and your star-spangled patriotic work of art is complete. 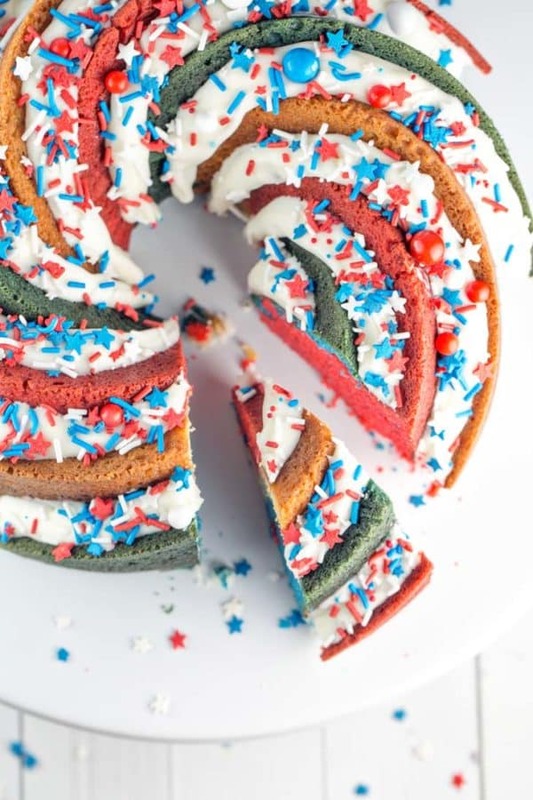 Grab a knife and a fork and dig in — while gorgeous, your Red White and Blue Bundt Cake is definitely not too beautiful to eat! 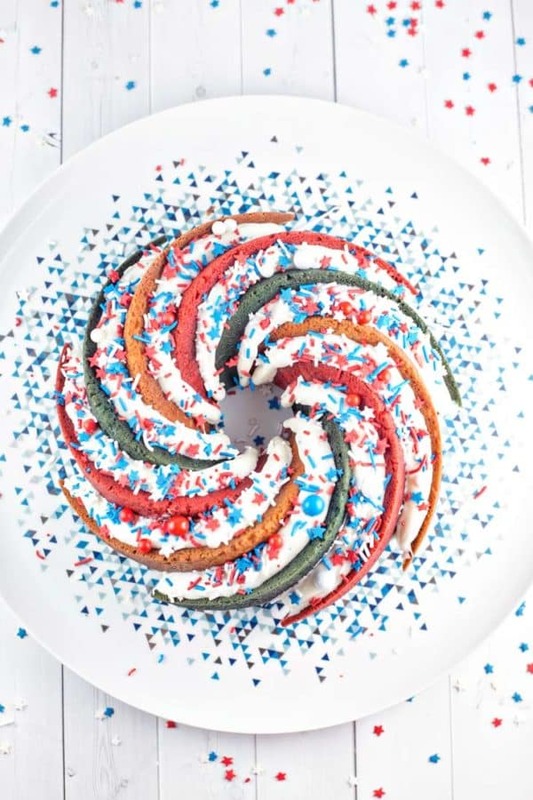 Celebrate America with the ultimate patriotic cake: this three-toned Red White and Blue Bundt Cake is as delicious as it is beautiful. Preheat the oven to 350 °F. Grease and flour a bundt pan (I used this spiral bundt pan). 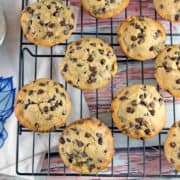 Using a mixer, beat the butter on medium speed until light and fluffy. Add in the sugar and eggs, continuing to beat until combined. Lower the speed to the slowest setting; slowly pour in the milk and vanilla. Add in the flour, baking powder, and salt, continuing to beat until combined and no traces of dry ingredients remain. Divide the batter into three bowls. Set aside one bowl; add several drops of red or blue food coloring to the remaining batter. Transfer the batter into pastry bags or a ziploc disposable bag. Snip off the end of the bag and pipe a very thin layer of batter into the crack of the spiral, alternating between red, white, and blue. Continue to add more batter in the appropriate color, working around the spiral until all batter is transferred into the pan. Gently tap the bundt pan on the counter a few times to even the surface of the cake. Bake for 45-50 minutes, or until a tester inserted into the center of the cake comes out clean. Cool cake in the pan for 10 minutes, then turn out onto a wire rack and cool completely. 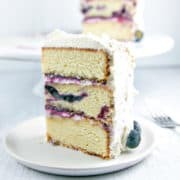 To make the glaze, whisk together the powdered sugar and a few tablespoons of the heavy cream, adding additional heavy cream until the mixture is just smooth. The consistency should be more like frosting than a glaze. Transfer the glaze to a pastry bag and pipe icing down the swirls. Decorate liberally with sprinkles. I just can’t stop laughing! What a beautiful cake! 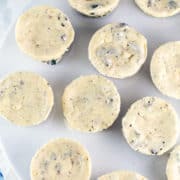 I am also not a cream cheese frosting fan, so I love the variation you came up with! 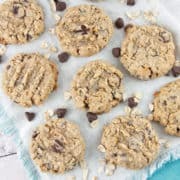 You always have the most beautiful recipes! I have this bundt mold…I’m so going to have to make this!! 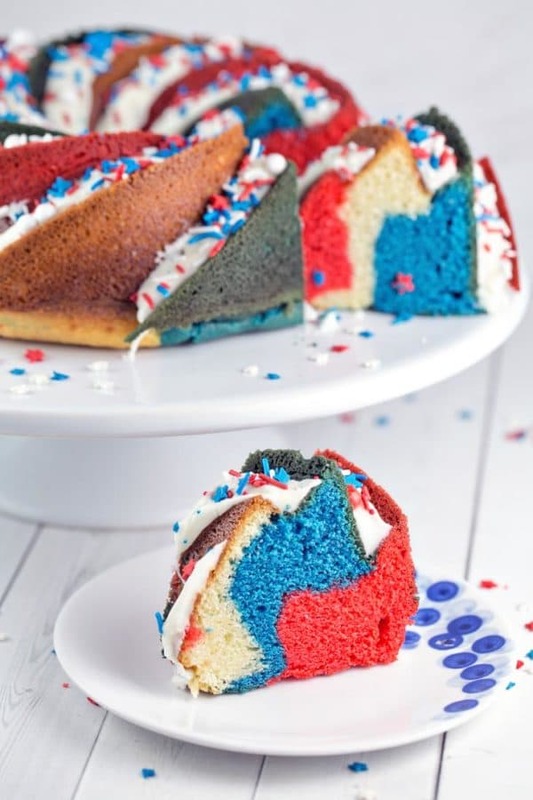 I love this cake for a July 4th party!! So pretty! !